Overview & specs of Humax HDR-2000T Freeview HD Recorder 500 GB by Currys PC World. Access exciting free-to-air HD digital TV channels with the Humax HDR-2000T 500 GB Freeview+ HD Recorder, packed with recording, multimedia, home networking and on-demand services that give you the ultimate TV experience - subscription free.So what does Freeview offer?Plug the Humax HDR-2000T into your HD Ready TV and access four high definition (HD) channels and up to 50 Freeview standard definition (SD) channels with 24 radio channels.This free TV service is brought to you via terrestrial aerial, and includes BBC One HD, BBC Two HD, ITV 1HD and Channel 4 which can be seen in the their full glory on a 1080p television. There's so much more on offer, and this high-end set top box allows you to view, record and catch up so you don't miss out.Flexible recording facilityYou'll be able to record up to 300 hours of SD TV broadcasts or up to 125 hours of HD TV, all selectable from an easily-viewable electronic programme guide (EPG). Plan your future viewing using this eight-day EPG and the included remote control to highlight your desired channel and signal your intent to record by pressing the record button.Record a full series at the touch of a button - just choose which show you want to capture and allow Series Link to record the whole set of programmes, automatically saving all the episodes of your favourite show.Since the HDR-2000T 500 GB Freeview Recorder houses a twin digital tuner, you can record two programmes at the same time - even viewing one channel whist recording another. If there are recording clashes when you try to view and record more than two programmes simultaneously, the guide will suggest alternative ways for you to still view or record your favourite programmes.Chase play allows you to start watching from the start of a recording while the rest of the show continues to record. Programme starts are tracked by accurate recording so you never miss anything from your programmes. You can even record two-part programmes with a break in the middle using split recording, ensuring you don't miss the second half.Pause and rewind live TV can be activated at the touch of a button, so you can view a whole programme even if you're interrupted.Even more viewing enjoymentTravel through the Humax TV Portal to access a world of additional catch-up and on-demand services.All it takes is a simple connection to your home broadband connection via Ethernet, powerline adapters or a Humax wireless accessory, and you'll be able to view YouTube, BBC iPlayer, internet radio and more.Once the Humax HDR-2000T 500 GB Recorder is hooked up to a HD Ready TV via HDMI, the box will ensure the best-possible resolution on your TV in 1080p, 1080i, 720p, 576p, or 576i. Images become more intensely detailed and coloured whether you're watching the BBC, ITV, C4 or another channel, and SD programmes will be upscaled to look at awesome as possible.Dolby Digital Plus delivers clear, pure cinematic sound to fill your living room and immerse you in entertainment, while subtitles and Audio Description extend the enjoyment for those with poor sight or hearing.Home networking through your set top boxThe Humax HDR-2000T Freeview+ HD Recorder connects to the internet via Ethernet to deliver thrilling multimedia and home networking facilities.Play back media including photos, video and MP3s right over your TV by connecting a USB device, or attach the unit to a PC or laptop using your home router across the Ethernet port. This gives you a fantastic big-screen way to enjoy all your content.You'll even be able to share recorded programmes from the HDR-2000T with compatible devices around the home via your home network. Purchase the optional WiFi attachment to do away with wires or overcome your router being in another room.Easy setup and secure usageThe Humax HDR-2000T 500 GB Recorder includes an HDMI and Ethernet cable each to perfectly transmit HD pictures and sound. It's not technical and you won't need expert installation.Activate the parental control function in the settings menu to restrict certain viewing options for younger family members.With a large hard drive and plenty of options to keep you entertained, the Humax HDR-2000T 500 GB Freeview+ HD Recorder is the ideal companion for your HD TV. 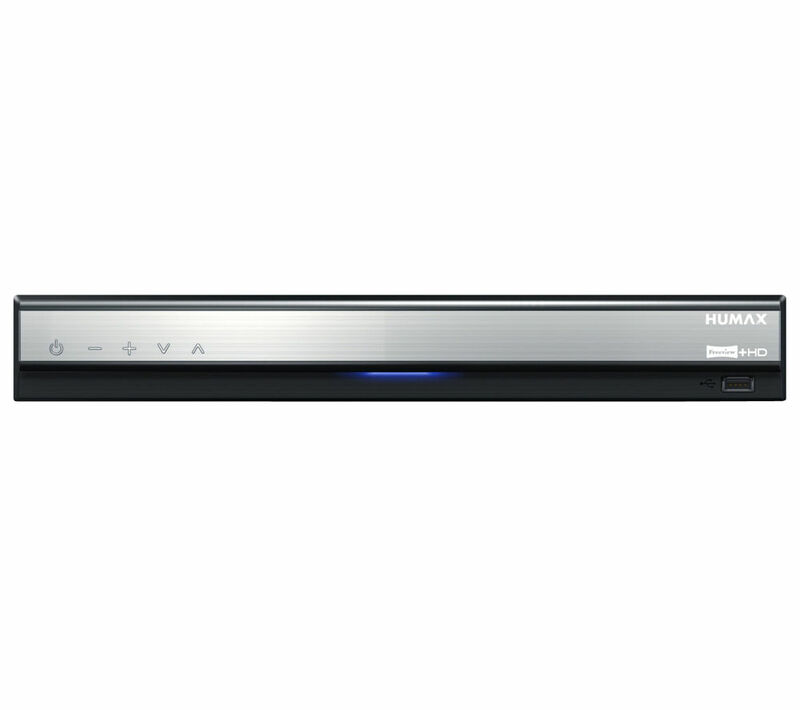 We are comparing prices for Humax HDR-2000T Freeview HD Recorder 500 GB in new condition sold by Currys Pc World.